It's kind of ironic when you think about it, but for a city that gets a whopping two weeks of summer a year (there's STILL snow on the ground), we sure do have a lot of choice green space in which to spend them. Like, a LOT of green space. 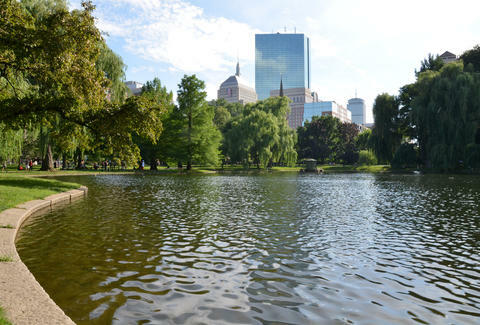 According to ParkScore 2015, Boston has one of the best park systems in the whole country, ranking eighth out of 75 cities thanks to factors like "people per acre" (131) and "proximity" (95% of us live less than a 10-minute walk to a park). 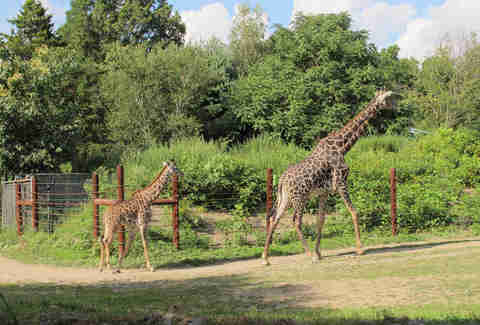 Basically, our beautiful parks are everywhere, and easy for everyone to access/enjoy. But which ones are the best? We think it's these 11, power ranked for your convenience. In 1948, socialite heiress Isabel Weld Perkins bequeathed her 17th-century estate to Brookline, including the family’s collection of vintage vehicles now on display in the carriage house. The picturesque 64 acres feature barbecue areas, athletic fields, an ice rink, Putterham School (ca. 1768), the Top of the Hill, and the pondside Temple of Love (based on the one at Versailles, NOT the Sisters of Mercy song). They also put on a bunch of car shows year-round, like British Car Day and Swedish Car Day and German Car Day... you get the idea. Lot of cars. 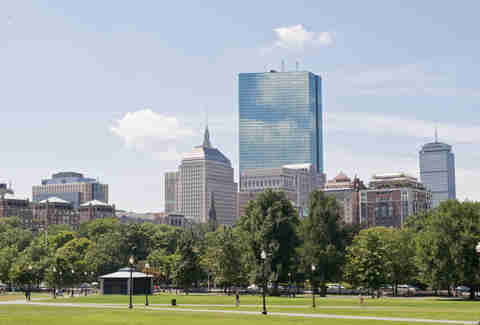 Boston’s biggest park is SO ginormous that it spans three neighborhoods: Dorchester, Jamaica Plain, and Roxbury. And it needs all 500+ acres to contain a zoo, the second-oldest public golf course in the US, tennis courts, baseball fields, lacrosse & soccer fields, playgrounds, cross-country courses, walking/biking trails, the playhouse, Ellicott Arch, Scarboro Pond, and Long Crouch Woods... wheeeeeeeew. 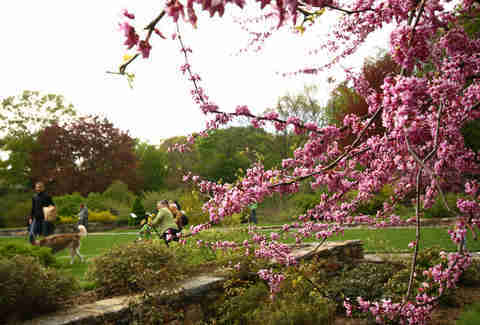 Designed as a “country park” by Frederick Law Olmsted, Franklin Park is the largest and last component of the original Emerald Necklace. Just kidding. Hyde Park is a neighborhood, and we wanted to give ‘it a shout-out. Word up, Hyde Park!!! Opened on the bicentennial, CCP was Boston’s first waterfront park, and it’s now part of the ever-growing “way better than it was” Harbor Walk. The compact 4.5 acres are loaded with everything from a playground, rose garden, and statue of Chris C himself, to a spray fountain, the Beirut Memorial, and the wisteria-covered trellis that’s lit during the holiday season. However, this harbor-side urban oasis is best for chilling, picnicking, more chilling, and people-watching during the summer. Or for hitting one of the many festivals, summer movie nights, and art shows. 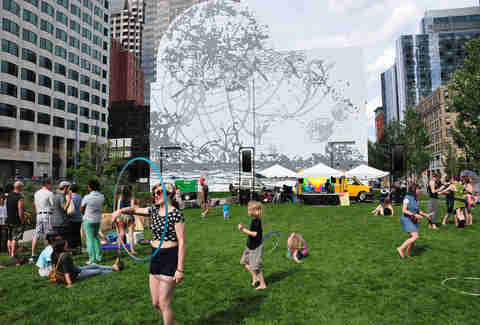 The Rose Kennedy Greenway is the amalgam of multiple parks sprouting from the much-maligned Big Dig project. You remember, the one that cost American taxpayers BILLIONS of dollars. Opened in 2008, it replaced the JFK Expressway (ironic) with huge lawns, fountains, gardens, rotating/permanent art, and that bitchin’ carousel. And she’s not just a pretty face, either. There’s the daily food truck rally in Dewey Square, the Saturday open market, farmers' markets four days a week, a concert series, yoga classes, and 300+ events (e.g. FIGMENT) every year. Major bonus: free Wi-Fi... enabling you to ditch the office and work outside. 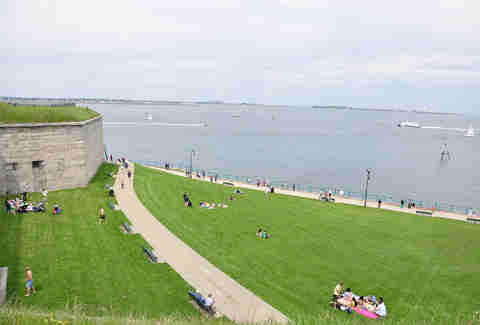 No longer really an island, Castle Island joins Marine Park and City Point Park on the sandy three-mile loop around Pleasure Bay. The main attraction is the pre-Civil War-era Fort Independence (a pentagonal stone behemoth suitable for touring), but the panoramic harbor view is a close second. Outside the “castle,” sprawling lawns make for ideal picnicking, and the iconic Sullivan’s Castle Island has clam shack treats and burgers for your seaside feast. Bonus: pack your rod and reel and join the other anglers on the fishing pier. 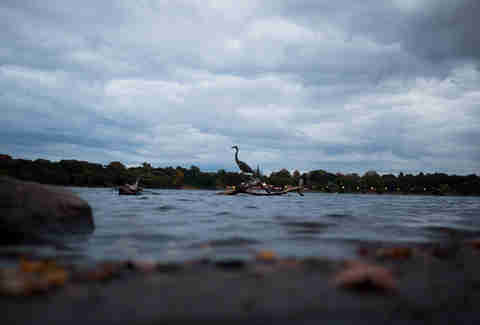 Jamaica Pond, part of the Emerald Necklace since 1892, was formerly a “country” retreat for Bostonians in the summer, and the ice supply for Jamaica Plain Ice Company in the winter. 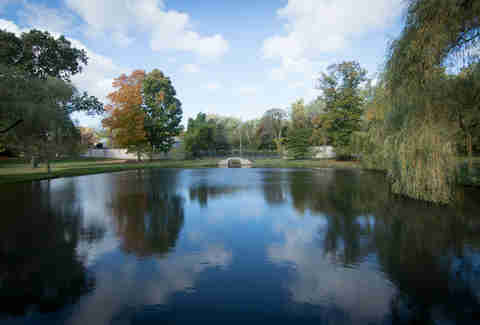 Olmsted made minimal changes to its natural beauty, allowing the glacial kettle pond to shine all on its own. Today, you can relax either on the shore or on the water, courtesy of the public Jamaica Pond Boat House that rents sailboats, rowboats, and kayaks. Pro tip: you must check out the annual Lantern Parade at the end of October for a one-of-a-kind light show. 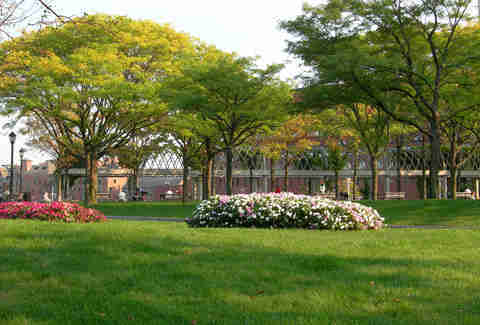 The Public Garden, Boston Common’s younger sibling, defines “manicured” with its Victorian-inspired flower beds (80+ species), lush grass, appropriately shaggy willows, and geometric topiary. And it was the first public botanical garden in America. However, the duck pond takes center stage as the legendary Swan Boats cruise the tranquil waters and onlookers take selfies on the bridge. (Then there’s the Make Way for Ducklings statues, of course.) But what’s up with the tropical plants, you ask? 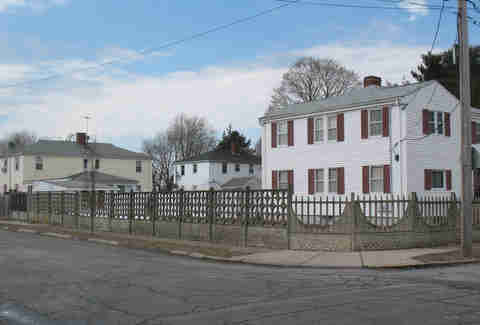 They’ve been a special feature since the beginning, mostly so that Bostonians (then and now) can see exotic flora right here at home. Once the Charles was dammed in 1910, the reclaimed land along the river morphed from ugly mud flats to the scenic Esplanade in a few short decades. The three miles of waterfront green space have it all: ball fields, paved paths, comfy grass, sunbathing docks, community boating, lagoons, playgrounds, and photogenic views. 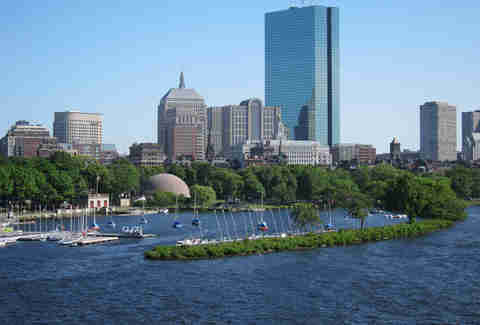 But it’s best known for the Hatch Shell and hosting the always incredible Fourth of July festivities. When it’s not crazy with rampant patriotism (USA!!! ), the Esplanade is a major fun-in-the-sun magnet whether you want to walk, run, bike, sit, nap, pretend not to stare at sunbathers, whatever.